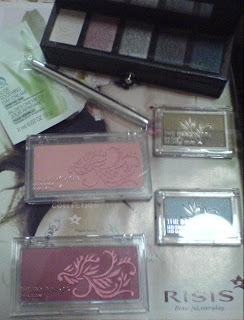 Beauty Blog: My The Body Shop loot is HERE! I'm sorry but I must warn my camera isn't really good. I got a sample of the Aloe Soothing Day Cream free. The sparkle eyeshadow palette is from their Christmas collection. The blushers and eyeshadows are from their Autumn Limited Collection. I swear I have been drooling over the blushers for the longest time. 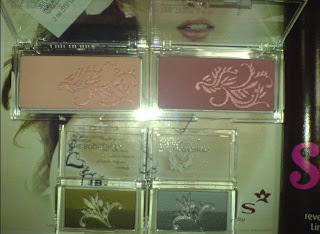 However the Cheek Bloom is selling at SG$34.90 in stores which is way too pricey. Managed to get it at a good deal. Items were going for 3 for US$10. That's about SG$5 each. :D Of course, shipping doesn't come free. But it's still cheap after shipping. It's my first time trying out The Body Shop cosmetics. I have heard bad reviews about them but there were some good reviews for these. I only wanted Cheek Bloom but couldn't resist the deal so I bought more. :P~ The lip brush is really soft I wished I bought more. It's still available so maybe if you are interested, you can still grab it. As for the blushers and duo eyeshadows, the packaging is really terrible. I had a hard time opening the casing. 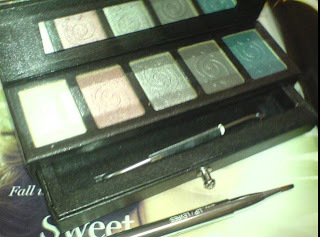 The eye palette is really pretty and comes with a mirror and a drawer with a long eye applicator. However, the drawer is a pain to open. I'm not going to be doing swatches since my camera is just lousy. LOL. If you are keen to know, you can read jojoba's review here (she does great swatches :P) for Cheek Bloom and the Sparkling Eye Palette. Or you can try My Women Stuff's review for Autumn Limited Edition and Cheek Bloom here.